In Lynchburg, Tennessee, the name Nearest Green has always meant something special. His birth name was Nathan Green but those who knew him best, his family and friends, called him Uncle Nearest. No one actually knows how he obtained that nickname, so we assume he was the “nearest and dearest” to so many who came in contact with him. An incorrect spelling of his name in the 1880 census as Nearis, has caused some confusion. But rest assured, no one in his family is confused about the spelling of his name: Nathan “Nearest” Green. Those outside of this small southern town 70 miles southwest of Nashville knew nothing of Nearest until a book published in 1967, Jack Daniel’s Legacy, revealed him to be the slave who taught Jack Daniel how to make Tennessee whiskey. Five years later, a publication of the Tennessee Historical Quarterly – Spring 1972 shared the history of Jack Daniel Distillery and listed Nearest Green as their first head stiller (what is now commonly referred to as master distiller). As the co-founder of the Nearest Green Foundation, Fawn Weaver, began researching this story more, she discovered not only was Nathan “Nearest” Green the first master distiller for Jack Daniel Distillery, and not only was he the person who taught Jack Daniel how to make Tennessee whiskey, he was also the first African-American master distiller on record in the United States. Nearest Green was the master distiller for Jack Daniel Distillery until it moved to its current location in Lynchburg sometime between 1881-1884. Although it appears Nearest chose not to move to the new Distillery, he did live nearby at County Line. Three of Nearest’s children, George, Lewis and Eli Green, joined Jack’s team at his new Distillery. Nearest’s grandsons, Ott, Charlie, and Otis, would later join them. At least one branch in the Nearest Green family tree followed Jack’s nephew, Lem Motlow, to St. Louis in 1910 when Jack Daniel Distillery was moved there due to Tennessee prohibition. The lineage of Otis Green (who later added an “e” to his last name, making it “Greene”), continues to live there to this day. In this early 1900s picture, Jack Daniel (seen in the white hat) with Nearest Green’s son, George Green, to his immediate right. Photo credit: Jack Daniel Distillery. 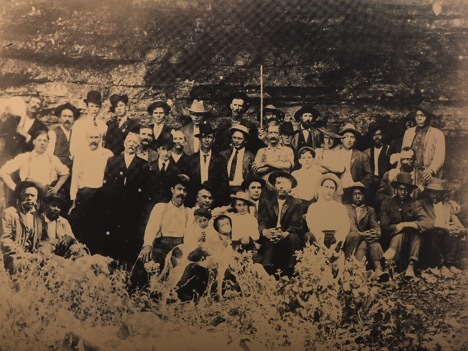 In this photo taken at a time similar to the one above, we see a young Reagor Motlow sitting in the front row with his white hat tilted. We are able to age this image by estimating his age. On the front row, third man from the right is Ott Green, the grandson of Nearest Green. The man to the right of him, Charlie Green, is also the grandson of Nearest Green. Both are the son’s of the man thought to be seen in the image sitting next to Jack above, George Green. Sitting behind these two men on the second row is Eli Green, the fourth-born son of Nearest Green. 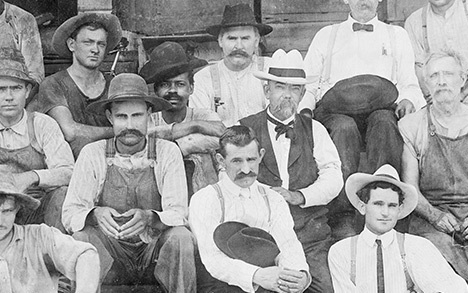 All together, there have been seven generations of Nearest Green descendants who have worked alongside Jack Daniel’s descendants at the distillery and places owned by the distillery.